Maybe you’ve already trekked the AT, the PCT, and an alphabet soup of other thru-hikes. I know. Those simply whet your appetite for more. So now you’re looking for something a little more exotic, of course with more than its fair share of challenges. Well, you’re in luck. Recently we heard about five new trails established across the Alps. 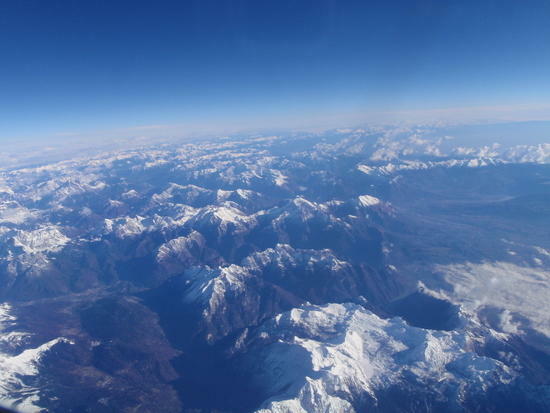 The Via Alpina loops from Italy’s Adriatic Coast to Monte Carlo on the Mediterranean. By combining a network of pre-existing long distance routes, the Via Alpina traverses the continent along the backbone of the Alps for an amazing 5,000 kilometers or more. Designed as a European cultural itinerary, you can experience jaw-dropping Alpine beauty, culture, nature, ecology, history and cuisine in whatever region you choose – for as long as you can get away. The Via Alpina offers something for everyone. I share your sweet addiction for what I call “slow, deliberate travel.” For me, it was born on the wild steppes of Tibet as my wife and I hiked 1,100 kilometers from Lhasa to Kathmandu – and it’s become my passion. So I wanted to be among the first to hike the Via Alpina’s entire length across eight countries: from Trieste, Italy through Slovenia, Austria, Germany, Liechtenstein, Switzerland, France, and finally down to Monaco. I hoped to descend to lower altitudes in the French Alps-Maritime before snow hid the trail in autumn. It was bound to be more difficult than any other I’d ever attempted. That was an understatement. Each and every day meant climbing at least 3,000 feet from valley to mountain hut where I’d sleep. The Via Alpina route map. Still, as a veteran of ten long-distance thru-treks, the Via Alpina sounded perfect; a physical and mental challenge combined with the best way to discover the Alps. I already knew it was an area of more than cheese and gnomes. In my mind’s eye, I envisioned it as a European Appalachian Trail – only with better food and wine. Even lite-trekkers travel on their stomachs, and sausage, fresh alpenkäse, corn polenta, and wine sounded a little better than peanut butter, tinned meat, and beer. Faster than you can say strudel, I convinced my wife Cheryl to join me. But first, we had a laundry list of details to face. After realizing it’d take five months to hike this 1,200+ mile trail, we discovered we had to apply for visas. This was a first for us in Europe, but not too much of a hassle. Nowadays with the new Schengen Agreement, Americans can stay in EU treaty countries for only ninety days at a time, not per country. On the downside, it meant we had to leave our home and jobs, lighten our life by selling most of our possessions, and trek off together into the unknown on this latest adventure. With that settled, we immediately began equipping for this ultimate challenge. We’ve long been confirmed lite trekkers and have whittled down our necessities to seven kilos (15 lbs). I know, some folks trek with less, but we were talking about a four-month hike where weather conditions are notoriously fickle. We’d encounter rain and high altitude sun in temperatures ranging from near freezing to 90 degrees. There might still be snow in June. At 6,000 to 9,000 feet, it can be sunny, raining, snowing, hailing, and fog-covered – all on the same summer day. And we’d been warned about dry Föhn winds that can drive hikers more crazy than usual. With this in mind, we eagerly approached GoLite, whose gear has already seen me through several thru-treks, including one from France to Israel while founding the Templar Trail in 2006. We upgraded to their latest Pinnacle pack and added their down sleeping bags, down jackets, and wicking t-shirts that’d prove handy in any condition. Then, after researching lightweight tents, we approached Gossamer Gear and chose their Squall Classic. Although the information from the Via Alpina organization showed either mountain huts or pensions along the routes, we could never be certain to complete a stage each day. It all depended on trail conditions, weather, and our own physical state. Mountain huts take trekking to a whole new level. At any age, hiking 20-30 kilometers a day for months over severe elevation changes is an unknown. It’s one thing to go to 12,000+ feet and remain there for a month, as we had in Tibet. It’s a different story to make a tough climb and descent each and every day. We packed a dependable lightweight tent just in case of emergencies. Finally, we stocked up on topographic maps to cover the route in greater detail. Past experience told me it’s not always possible to find good maps en route. Omni Resources came through and supplied us with nearly thirty, which also gave us time to plan each day’s trek more in-depth. Given their weight, we each carried a few at a time and arranged for new ones to be mailed along the way. Over four months, as plans came together and our visas were approved, Cheryl and I worked out at Upcountry Maui Fitness every other day, attempting to beat our average bodies into Alpine shape. This trek was no walk in the park. We spent extra hours on their incline treadmills to simulate climbs, then lifted weights and worked on balance exercises with dreadlocked Izaac, our trainer. For example, even though our topo maps covered most of our route, searching for trail markers became a frustrating daily routine across beautiful, bewildering Slovenia. Often they were on half-buried posts in snow. 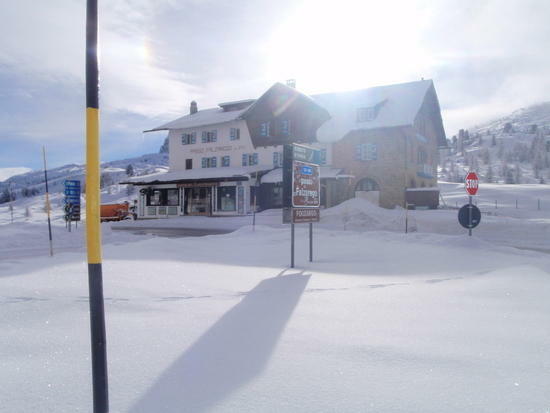 One hut they claimed was simply “closed” was permanently shuttered – wiped out in an avalanche. Early on, even in the Julian Alps, the trails were slow going. It was impossible to make it back to Mt. Triglav as planned, and we were forced to improvise. In June, ice fields blocked our paths across narrow, slippery scree. Without ice axes and crampons, we dug footholds and inched our way across the steep scree inclines, flattened, using our LEKI Nordic sticks as anchors. Remember Ötzi? He’s the 5000-year-old Alpine hunter recently discovered beneath a receding glacier. We didn’t want to end up like him. Watch your step in Slovenia’s Julian Alps. What’s a day without another scree scramble? Even with our caution, Cheryl ended up dangling over a 1,000-foot precipice, anchored to the ice only by a slender pole. A badly injured knee threatened to end her Alpinist days then and there, but her tenacity and improvisation came through again. Considering her limping condition and the relentless rain and too-close-for-comfort lightning, we ducked into the valley where we shadowed the upper trails until her Q-tip shaped knee grew stronger and the storm front passed. That brief detour took us down into timeless Tyrolean villages, which gave us a chance to discover their unique mountain culture, music, food (including the baseball glove-sized “Mother Schnitzel”), local wines like Müller Thurgau, and unfiltered Hefeweisen beer, a meal in itself. Soon we were back on the Red Route enjoying nature one step at a time. We hiked through secluded verdant valleys looking like something out of Lord of the Rings, and past the donka-donk of bell toting cows. We found a profusion of wildflowers, orchids, edelweiss, and alpenrose, while Steinbok, chamois, ermine and roly-poly marmots might appear around any bend. Our Rivendell had fifteen waterfalls, near Meiringen, Switzerland. Steinbok are surprise companions, as well as chamois, ermine, and marmots. Edelweiss, alpenrose and orchids brighten foggy Austrian days. It didn’t take long to realize there was no way we could finish the 161-stage Red Route in one season. That would often mean hiking two stages a day. So we improv-ed once again (we call it “walking jazz”) and soon connected to the Via Alpina Green Route, aka the Swiss National Trail, to trek in the shadows of legendary mountains like the Eiger, Mönch and Jungfrau. We then rejoined the Red Route in France for a circuit around Mt. Blanc to connect with the Blue in southern France to again meet the Red for the final surge into Monaco. Keep an eye out for ‘easy-to-spot’ markings. That’s a unique aspect of this trail vs. American paths. There is no one route. There are five interconnecting trails. Mix and match them to adapt to your condition, time constraints, weather, or regions of interest. Believe me, trekking the Via Alpina is an incredible experience on many levels. No two days are alike. Just as there is no one trail, there is no one Alps. 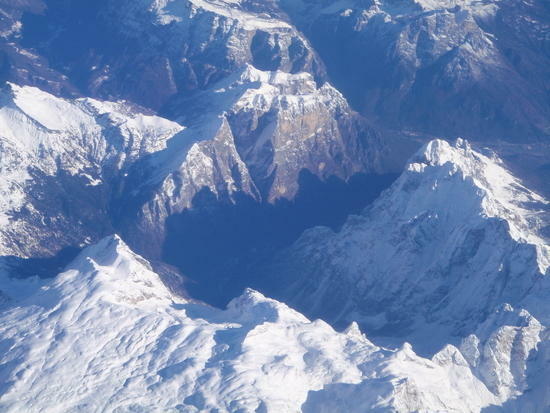 Each valley can mean a change in languages, customs, food, and trail conditions. In one section, trails are elusive. In another, they’re marked by wide stripes every 200 yards. The paths are equally varied: running through deep valleys, across scree, wet bogs, down forest trails, over mountains of cow patties in alms, through villages, down ski runs, and back up to eagle perch mountain huts for jaw-dropping sunsets. Nothing beats reaching a summit, Mt. Blanc from Col de Brévent, France. We usually spent the night at huts, many run by the local alpine clubs. It was a great way to meet fellow trekkers and locals. Bunk beds in their dorms (15-25 euros) often included a hot shower. I know, a real extravagance. The food was hearty, drinks were cold, but prices a little high given the dollar’s anemic exchange rate. The huts, by the way, are busier than trails, especially in August, when reservations are recommended. It’s possible to wild camp in some secluded spots. Outside villages, you can always ask a farmer. However much of the trail runs through national parks which generally have a “no camping” policy. Then again, sometimes you might be able to pitch your tent at dusk and leave by dawn. But no fires are allowed. Some Swiss villages offer “Schlafen in Stroh” (Sleep in the Straw) in the summer (18 euros) when the cows are up in the pasture. You simply roll out your sleeping bag atop fresh straw in the barn. It’s an eye-opening way to experience today’s farm life, complete with handmade cheese – and authentic Alpine aromas. Local legends are another part of the Alpine story. After all, this is the land of gnomes, elves, talking animals, and wayward knights. One grand old lady who manages a hut facing Mt. Blanc delighted us with the tale of Mt. Jolly and the lovelorn shepherd whose tears froze to form the glacier at its base. For much of the trek we too were alone, a welcome change after the popularity of some trails. We only encountered a few folks each day trekking or mountain biking only portions of the Via Alpina. Otherwise, we had much of the trail to ourselves. Kicked back in the shadow of the Eiger, Mönch and Jungfrau. As usual, we met eccentric folks along the way. One such hiker, an Irish wolfhound of a guy, insisted on stripping down to his skivvies to show one startled woman at dinner just how “lightly” he packed. (She was sorry she asked.) But as you know, laughter lightens any load. And how could we forget the food? One of my fondest memories is of a rainy night at a shepherd’s stone hut. First, the quiet fellow grilled steaks, onions, and potatoes. Luxury! We no sooner finished that serving than he appeared with seconds… then thirds. Then, since it was another guest’s birthday, he appeared with a three-layer cake topped by fresh berries. Before saying goodnight, he offered bottles of schnapps, insisting we help ourselves. Overall, the Via Alpina has one thing in common with other long distance trails. We rediscovered simplicity and balance. We disconnected and reveled in the quietude of nature. Finally, this was the challenge of a lifetime. For the record, from June to mid-September we ascended and descended almost 700,000 feet total – the equivalent of climbing twelve Mt. Everests from sea level. Each night I chronicled our very real and gritty adventures while muscles still ached. I hope our “unsanitized for your protection” tale feeds your wanderlust. Join us for an always candid, sometimes painful, often humorous look at our journey – and at an everyday couple who followed their gonzo dream. And yes, even today, we’re still in the Alps! Italy’s Dolomites are breathtaking, especially for hikers. 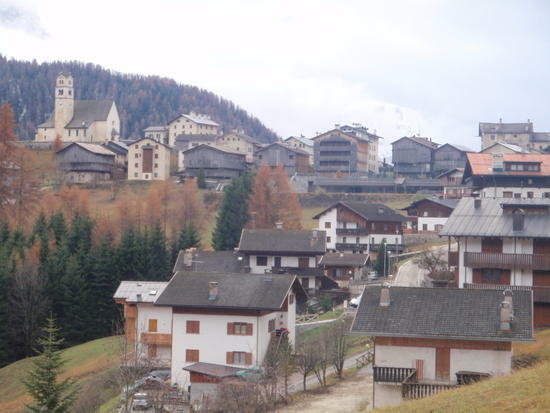 Over the Top & Back Again: Hiking X the Alps by Brandon Wilson, the Lowell Thomas Gold Award-winning author, was published by Pilgrim’s Tales in October 2010. It’s the first trans-Via Alpina travel narrative published in English, with 53 photos, maps, and custom illustrations by Ken Plumb. Available from Amazon or your favorite bookshop. There is nothing like a great article to get one dreaming! Moments after I finished the article I found the Via Alpina website and started to imagine a trip there (or more than likely 3-4 summers doing parts [colors] of these trail). I have spent summers riding across some of these areas covered and, on many days, I would look out when approaching a pass to imagine what it would be like to be out there on the trails. 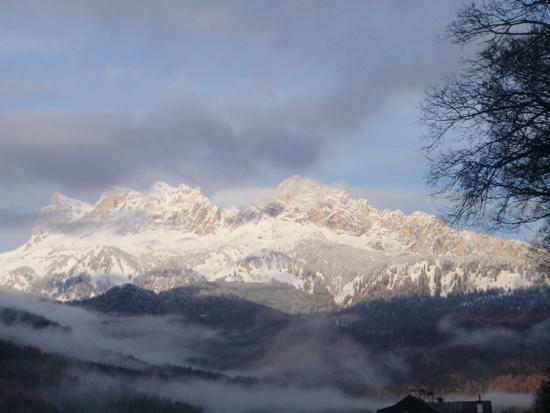 Now I have another reason to go back to the Alps and the Dolomites. Thanks for the great write-up, very inspiring to say the least. It is great to see beyond the usual (big 3 of the U.S.) suspects. The elevation gain/loss is equally impressive. Keep up the good work you two! Ausgezeichnet! Beautifully done, inspiring read. Great trip report. Thank you very much for sharing. It sounds like it was a great adventure. I just looked your books up on Amazon and they all have great reviews. As someone who recently moved to the land of the Alps, I will certainly be adding this book and your others to my list! Any chance your books may be made available via Kindle soon? Thanks again. A great "taster" trip report. It caught my eye especially since I walked the GR5 with my wife last summer for our honeymoon and it partly shares some of the Via Alpina routing. In fact I instantly recognised that first picture of the Refuge de Moëde-Anterne as somewhere we stopped for a coffee! We hiked for a few days with a Belgian guy who was completing the whole trail (the longest, red?) in four months (he'd practised on the AT and PCT first) and he also said that Slovenia was a "challenging" place to hike. He was there in very heavy snow and ended up walking with some Slovenian military guys who were out training. Without them he reckoned he may have been in trouble. As well as an ebook that apparently is more fun to read than I expected since it was only a blow-by-blow diary! Reading this trip report certainly makes me hanker to get back out there. Might have to buy the book! If this inspires you, I can highly recommend the book "Clear Waters Rising" by Nicholas Crane, which chronicles his continuous solo walk from Cape Finisterre to Istanbul over 17 months. It is extremely well written, full of stories about local ledgends and the people he meets. His exploits are typically understated, not surprising given that he is an eccentric Englishman, but I think his is an outstanding achievement, which so far as I know, has never been repeated. Wow, that's over 5,500 vertical per day! If you like, you can virtually stay, at the foot of the Grossglockner (3.798 m). That is next to the "Via Alpina" Trail, in Austria (east tyrol). I was there 4 weeks, last year. My backpack had 30 kg. 10 kg for the backpack with equipment, 10 kg of food and 10 kg of photography equipment. So I could stay 10 days in the beautiful mountains. The panorama consists of 700-900 individual photos. Which are composed to have a 360° view and a resolution who approximately corresponds with my perception. Because the human eye has a very high resolution. The panoramas have a resolution of 3000-5000 megapixels. Thanks for reminding me about "Clear Waters Rising" Stuart – a friend mentioned it some weeks back and I realised I'd not added it to my Amazon Wish List. They are excellent! I know something of how you feel since I tend to carry around 3.5 to 4 kilos of photographic kit myself. I didn't know you could view panoramas in Google Earth – that's a great way to do it. > Wow, that's over 5,500 vertical per day! Yup, typical of parts of Europe. Great article. It's always nice to read trip reports from other parts of the world since we in the US aren't always able to explore other regions. 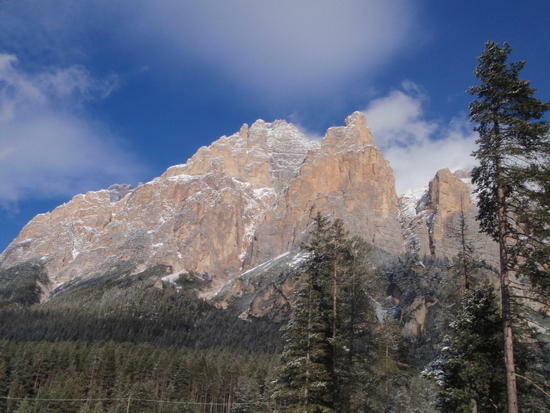 I have not been on that trail, but did get a chance to spend a day (not nearly enough time) in the Dolomites in November a little south of the Via Alpina. It really is spectacluar country, and I have been in the Sierras and Cascades several times. It was between seasons, so it was nearly empty. 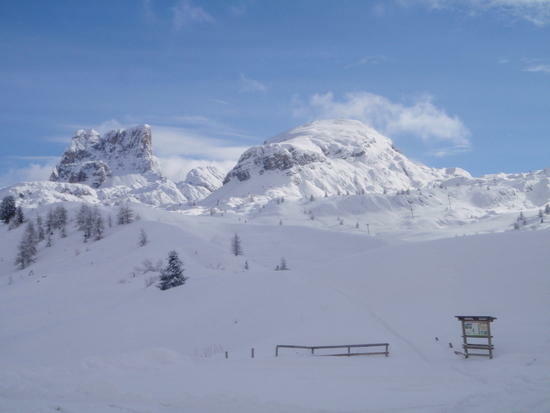 Unfortunately, I wasn't able to bring snowshoes so my hiking was limited to postholing at the Passo Fazarego then a short hike at lower elevations through the pines. Here are a few photos from that day. What a grand trip and inspiring. Beautiful report of your adventure. Hey, thanks for everyone's comments. Hiking the Via Alpina is one heckuva challenge to be sure. But there's something for everyone and you will NEVER be bored. Hope this article whetted your appetites. See you on the trail. A question for the vet Alp backpackers here. We have a group of 3 UL backpackers equipped with ice-axes and crampons who are looking for a mountain route in Europe for the first 3 weeks of June. Is the Swiss part of the Via Alpina doable at this time of year? Are there any resources available for cost estimates on the trip, per diem? I'm headed out to Italy and Switzerland this summer with a Study Abroad program with the University of New Mexico, and I thought it'd be a great opportunity for me to spend some time backpacking through the Alps. I'm planning on a 30-day trip (after the study abroad), and I was curious if there were any estimates on how much it would cost per day. I'm a student, and I'm definitely willing to travel cheap!! Thanks! Just back from the Red Route from Trieste to Oberstdorf, seven weeks. Slovenia was OK. There's a lot of limestone country, lots of scree, not a lot of water in some places, and a lot of cows … We had a heat wave, several snow storms, a lot of fog, and some sunny weather. We took a couple of 1-day lay-overs for general restocking and cleanup, and had to retreat once when the snow on the pass was a shade too much – OK, it was storming as we attempted. Otherwise we just kept going. We went Refugee rather than tenting for most of the trip – after being hit by 150+ kph winds one slightly extreme night at the start. Food pretty good, but we never want to see another knodel. I was in Bled, Slovenia for a week or so in 2000 with my brother, and we tried to do some hiking on our own (had maps, etc. ), but couldn't find the "clearly marked" trails to save our lives! We gave up after a few hours of wandering around part of the way (didn't want to get lost!) and hired a guide for a couple days (while we were at it, we went ahead and hired him to guide us up Triglav). Timing was good, as it was the middle of July and the trails/hut on Triglav had just opened for the year (though still lots of snow, of course). One of the things I distinctly remember about this trip was the food our guide brought – I forget the name, but it was basically solid pork fat/lard with pieces of pork embedded, which was spread on dense bread (or eaten with a spoon). SERIOUSLY calorie dense. I loved it. I was very glad we had a guide in this case, because the trails on the approach were NOT clear or obvious at all (we kept looking to see if we could pick out any markings). Also, he was helpful in timing the ascent to the top so we didn't get blown off by weather. His name was Yuri, and he was great (he did mountain rescue when he wasn't guiding).